Have you ever experience when your car brakes are coming to an end? The noise, the smell and the squeaking sounds seem unbearable. Does this sound common to you when your brakes need changing. Applying pressure to the pedal can be difficult as you are unable to stop the car. The next thing you may have to do is gently try coming to a stop because if not you may end up crashing into another vehicle or an object. Brake pads, as the name implies are a section of the car’s braking system that actually take the impact of resistance necessary to stop any vehicle. Different types of brakes exist including the disc brakes, antilock brakes, drum brakes and emergency brakes. In a disc brake system, the brake pedal activates a hydraulic line which squeezes the calipers against the rotors of the car’s tires. These pads are located between the calipers and the rotors to absorb the energy and heat, which provide grip to stop the car instantly. Disc brakes are the round flat piece of metal like object that can be seen around your wheel and caliper which holds the disc brake pads. It works when you press the brake disc to the wheel and or axle to cause friction. Any time that you apply your brakes, the brake discs are squeezed against the wheel on either side by brake pads. Disk brakes are often used in vehicles such as cars and motor bikes. Anti-lock braking system (ABS) is an automobile safety system that allows the wheels on a motor vehicle to maintain tract contact with the road surface according to driver inputs while braking, preventing the wheels from locking up, ceasing rotation and avoiding skidding that you do not want. Did you know that vehicles also come equipped with another braking system, known as emergency, or parking brakes? Yes it does. Hand brakes as it is normally called are a secondary braking system installed in motor vehicles. This tool in your car is not powered by hydraulics and is separate from your normal brakes used to slow and stop your vehicle. And, yes, they are also used in emergency situations when your stopping brakes are gone. Good to now! A drum brake is a brake that uses friction caused by a set of pads that press against a rotating drum-shaped part called a brake drum. When using a drum brake, hydraulic pressure from the master cylinder causes the wheel cylinder to press the brake shoes against the brake drum hence creating friction between them to slow or stop your car. Now that you have learnt the different types of brakes, let’s move back to our topic. 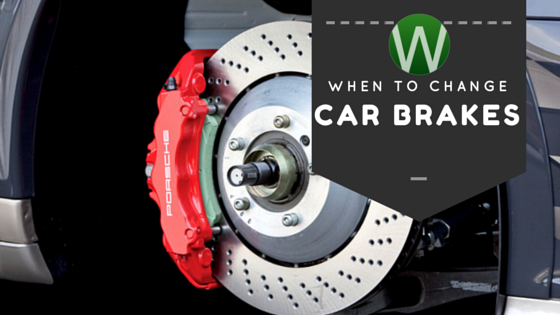 When should you change your brakes? Brake changing has no set timing, no set criteria that tells you when it’s time to be replaced. However, if you know your car very well then you will be able to tell when you need to change, for example the noise the car will keep, the way the car feels on the road etc. If you are not sure an experience mechanic or an auto technician can check your brakes for thickness of the pads. Also the new versions of cars these days have high technology to send signals that will tell you when your brakes need replacing. Other than that when you press your pedal hard or apply your brakes you will hear a screeching noise. This noise simply raises a red flag for attention. Does that sounds familiar to you? Also all cars have a brake warning light that comes on for a few seconds every time you start your car. This light may also comes on while driving. When this happens it may mean that your brake system is low on fluid because of a leak or a problem with the brake master cylinder. Note that this is not the same warning light that comes on when you apply the hand- or foot-operated parking brake. When your steering wheel is vibrating it may mean that your tires need to be rotated or your tires needs air. Another factor that your steering wheel is not functioning properly may mean that there is a problem with your braking system. Do note that you have to ensure at what point that your steering wheel vibrates, is it only when brakes are applied? If so then you need to inspect the brake pads of the vehicle. This is very familiar when you apply brakes on a car that is going downhill. When your brakes are starting to finish your brake pads will definitely make a noise like metal grinding that is when your car is moving. That noise will get louder as the brakes are pumped. You can carry out an inspection on your break pads to ensure that all is well and how low is your brakes. You can check for thickness and it must not be lower than quarter inch (1/4 inches), if it does then you need to change your brakes. Drivers, this is familiar as well when your brakes needs changing. When you apply pressure to your brakes and you hear a grinding noise this simply means you need a new pair of brake pads. When you hear this noise it means that the metal disc and the metal caliper are rubbing against each other and you have no brakes left for use. If you are an experience driver and your vehicle “pulls” to one side while braking, this actually means your brakes is not on par and needs to look into. You need to take action as soon as possible because it may mean your brakes needs changing. However, if when applying your brake pedal and it feels light weighed or it is not responding as it should, then it means that your brakes need attention. There you have it, so try not to spend extra money that you did not budget for. It’s advisable that you check your brakes approximately 11,500 – 12,500 miles or to be on the safe side you can check your owner’s manual to find out the exact timing. Keep in mind though that having proper car maintenance will also assist you to keep tabs on your brakes as well.